I'd picked Kiel as our overnight stop because it was a great opportunity to catch up with schnee, who lives there. He'd picked a French café for brunch, and we made our way through rain showers, past a pretty harbour where impressive warships lay at anchor, to join him. It was lovely to see a familiar face, and to hole up out of the rain drinking coffee and eating buckwheat pancakes with bacon, fried egg and cheese while we talked about travel, Kiel, whisky and Tintin. We were sorry to leave, but we had many miles still to go and a ferry to catch from Puttgarden in Germany to Rodby in Denmark. Before the ferry we experienced the border shop: a vast, floating hypermarket on three floors, filled with booze. A Carlsberg poster claimed it as 'Probably the biggest border shop in the world', and they're probably right. Scandinavians emerged pushing trolleys laden with crates of beer, wine and spirits, as well as soft drinks, sweets and washing-powder. I bought a litre of cloudberry vodka for €12 - only slightly more than I would pay for two coffees on the 45-minute ferry crossing. Denmark! Flat and wet, with rainbows dancing in the spray thrown up by other vehicles. We took the Öresund Bridge, nearly five miles across and a long-held ambition of mine, and then we were in Sweden, our third and final country of the day. Autumn, if you're lucky with the weather, is a lovely time of year to travel by bike: not too hot, not too crowded, with the leaves on the turn. We left the motorways for a road that ran along the coast of the Baltic sea, through little port towns, past churches with stepped fronts and low houses with high roofs. We noted that speed limit and Give Way signs have yellow centres rather than white, while chevrons warning of danger are a patriotic blue and yellow. 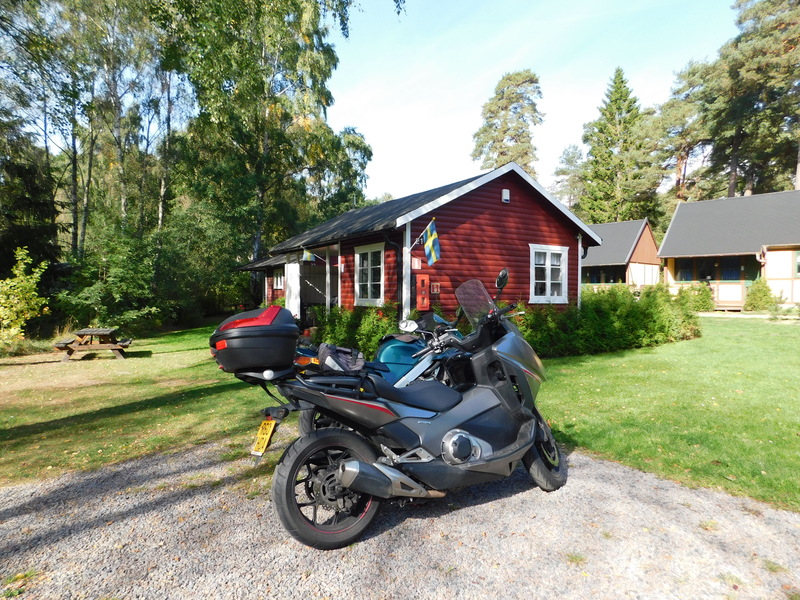 Our home for the night was a holiday camp in Ystad, a short scamper from the beach, where we stayed in exactly the sort of little red wooden cabin I had imagined. As we arrived I startled a red squirrel into running down a tree and immediately up it again. It was lovely seeing and talking to you, too! Very nice indeed to catch up with a friend you don't usually get to see. BTW, since you mention Tintin, did you notice the Gaston Lagaffe poster in the café? I know Howard looked at it, at least; and it's a wonderful comic by the late and great Franquin. If you like Franco-Belgian comic, this one's a must-read. That little red cabin looks perfectly Swedish and "mysig". I liked what I =saw of Kiel very much and I'd love to get a better look at it some time. I'll be back! I had to look up 'mysig', but yes, isn't it? By all means do come back! Ah, interesting, I'd not heard of Suske en Wiske — looks like they haven't seen much publication in Germany, which is actually surprising given how popular these sorts of comics are here. It's amazing how you can drive through multiple countries in one day over there. Not so much on this side of the pond. It could take several days to drive through the U.S., Canada or Mexico! Yes - it's amazing how the scenery and climate can change in a day, too! Ooh, fantastic!! You must be so excited. Where are you headed? Oh, fantastic - I hope you get to hang out together and have a ton of fun!